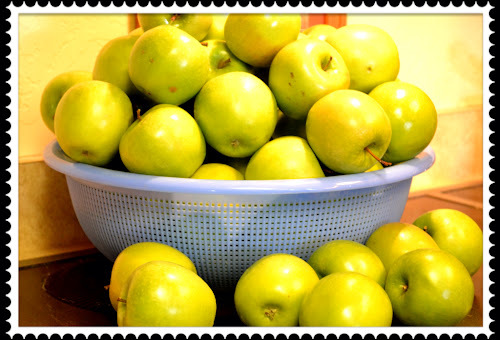 I grew up in the Midwest where apples were plentiful! I remember, back in the good old days, paying $2.00 a bushel to "top" the apple trees (that means picking the apples in the top of the tree). While the price of apples has certainly gone up, my love for a tart, crunchy apple with a little salt, fresh squeezed apple cider, homemade apple pie, and last but not least, Incredible Applesauce, has not diminished! 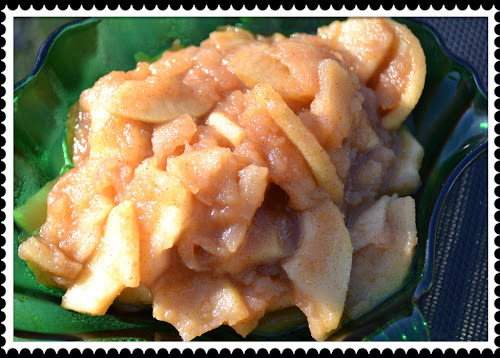 When the kids were little, I bought Mott's Natural Unsweetened Applesauce and made homemade applesauce once in a great while, as a treat. But now that I've perfected my homemade applesauce, I look for a sale on Granny Smith apples, usually in October or November, buy up a bunch, and make lots of Homemade Applesauce! 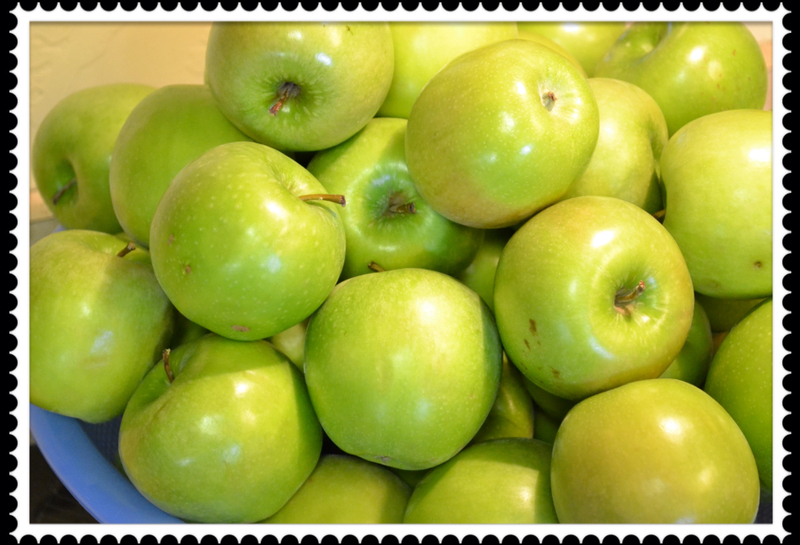 This year I found large Granny Smith apples at Pro Ranch Market. They were on sale on one of their 'Wednesday Produce Sales' at 2lbs/$1.00. I ended up purchasing 24 pounds. I have found that working with 6 pounds of apples at a time works best for me. 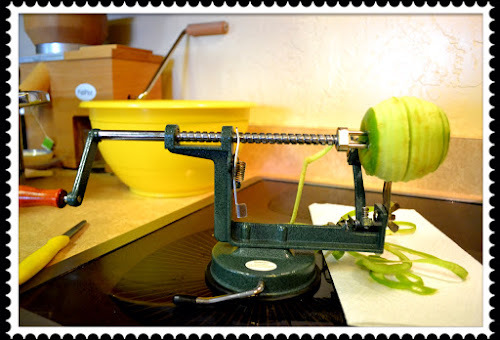 While you could peel your apples by hand, using a peeler, corer, slicer combo works the absolute best. 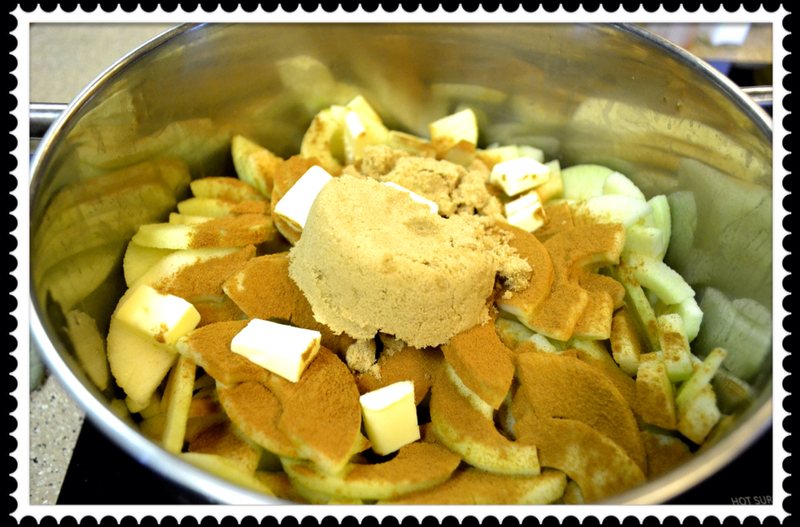 1/2 - 3/4 cups or more of packed brown sugar (begin with the lesser amount, you can always add more, to taste). 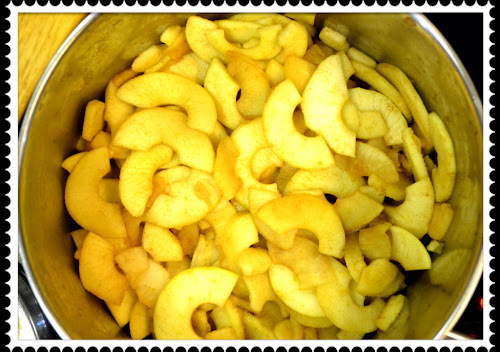 6 pounds of tart apples, juice from 1 lemon, 1/2 cup of water. Cook apples in Covered Dutch oven, simmer for the first 20 minutes on MEDIUM-LOW. Add 2 tablespoons butter, 1/2 cup packed brown sugar, 1 tablespoon cinnamon, 1 teaspoon sea salt. Stir bringing bottom apples to the top. Reduce heat a notch and cook uncovered on low simmer, stirring every 10 minutes. 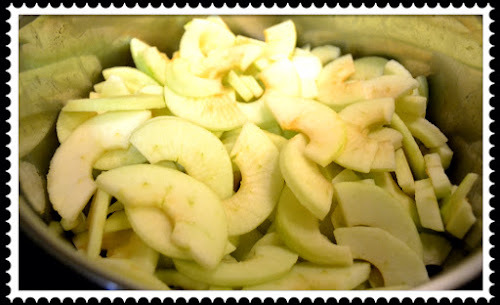 As apples cook down, add water 1/4 cup at a time to keep bottom from scortching. How long you simmer your sauce will depend on how soft you want your apples. I simmered my applesauce for 30 more minutes. How much brown sugar you add depends on your taste. 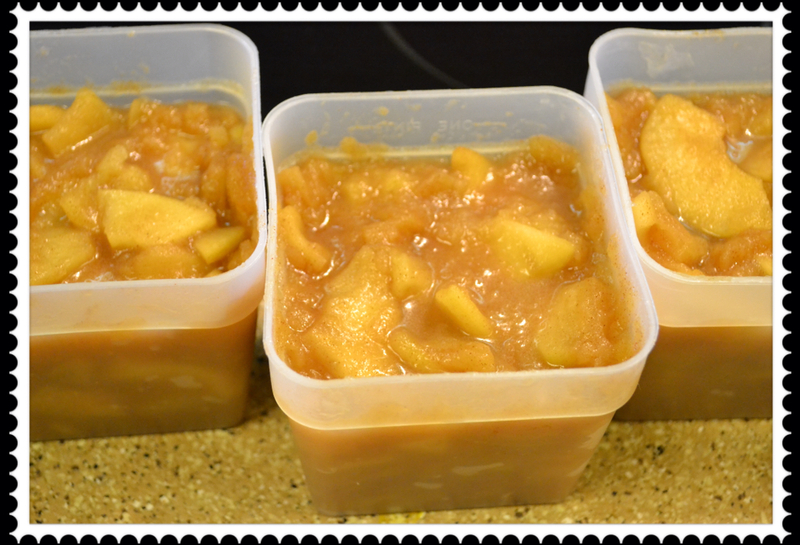 After tasting, I added 1/4 cup more of brown sugar and 1/4 cup more water to keep applesauce juicy. 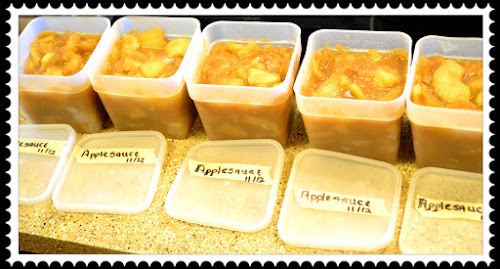 Homemade Applesauce . . . buttery apple goodness, flecked with cinnamon, and brown sugar. Serve up hot or cold as a side with pork loin or pork chops, over ice cream, in oatmeal or baked in muffins or cake. 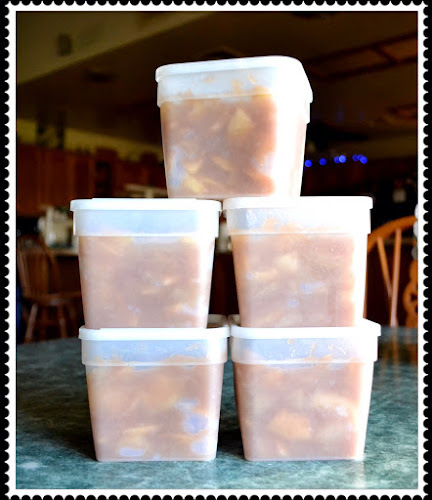 Spoon sauce in freezer containers. 6 pounds of apples equals 5 pints of Homemade Applesauce-- label and date. Cooled and ready for the freezer. 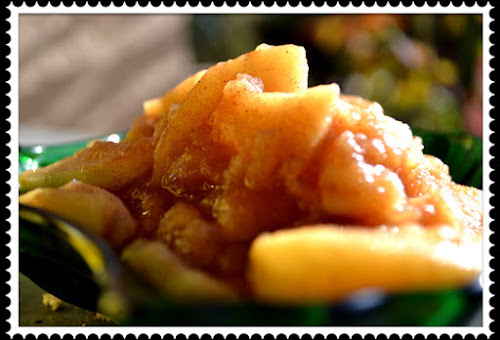 I have such wonderful memories of eating homemade applesauce at my Gram's house. 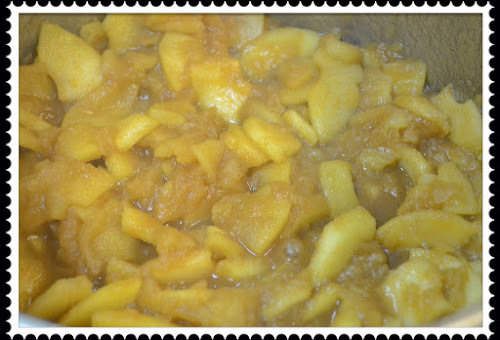 There's something really special about "cooking up memories" and continuing the tradition of Homemade Applesauce. 3 more batches of Homemade Applesauce still to go! It's smelling totally awesome . . . Over at Julie's!! !